ILS has the unique ability to help you de-risk large capital investments in high-risk R&D equipment. 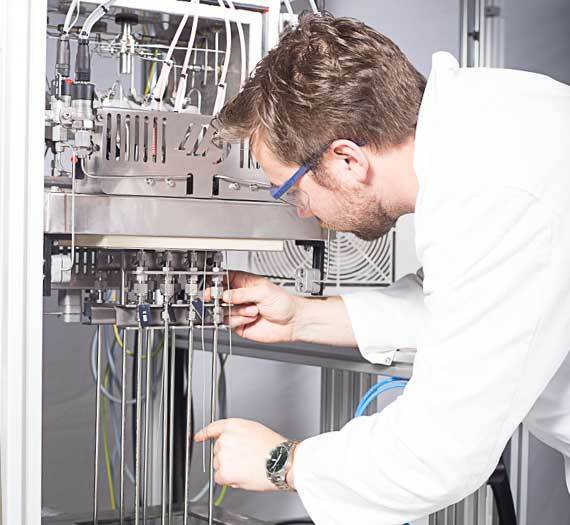 We do this by mutually agreeing on the most technically-challenging parts of the R&D solution and testing these in our in-house R&D testing laboratories. Typical examples of this include high-pressure/low-flow/viscous-liquid dosing, testing limits of reactor minimization or unique reactor concepts. By identifying and mitigating flaws as early as possible ILS can provide a huge leveraging effect to insure the success of the approach in question or provide our clients with an early, and low-cost exit from an investment in a solution, which may not work for the chemistry in question. Investment in an R&D testing unit always involves intrinsic risks. The more challenging or novel the chemistry, the higher the risk involved. Feasibility testing provides a convenient way to minimize risks to our clients whilst still providing the maximum flexibility to explore the newest possible technical solutions. A competitive edge often requires pushing existing boundaries. Conservative design is safe, but often limits the researcher. so feasibility studies make "out of the box" approaches possible with minimal risk to our clients. The feasibility study entails "carving out" the most technically risky part of the unit, replicating it separately and rigorously testing under identical conditions to the full-scale unit with real feedstock. We can design, construct and execute feasibility studies in 6 months or less which means the client gets a quick answer on what approach can best be taken for the project in question. The simplified design approach means that a minimal CAPEX investment is required by our clients. Fast execution results resulting in a short feasibility time and minimal project cost to our client. The selective hydrogenation of unwanted byproducts is a key step in the production of olefins. ILS was approached by a client in this project to demonstrate the feasibility of using small-scale, parallel fixed-bed reactors for screening selective hydrogenation catalysts. The tail-end screening of acetylene was used as a test reaction. ILS was able to demonstrate the ability to correctly measure and and rank catalyst performance under the challenging conditions of high conversion and low reaction temperature, where heat-management is particularly challenge. This successful feasibility ultimately led to the construction and delivery of a 4-parallel unit to a key account. The overall time for construction of the feasibility unit till delivery of data was 4 months. ILS was approached by another client to test front-end olefin selective hydrogenation catalysts. This was due to ILS successful track record in supplying tail-end selective hydrogenation units. 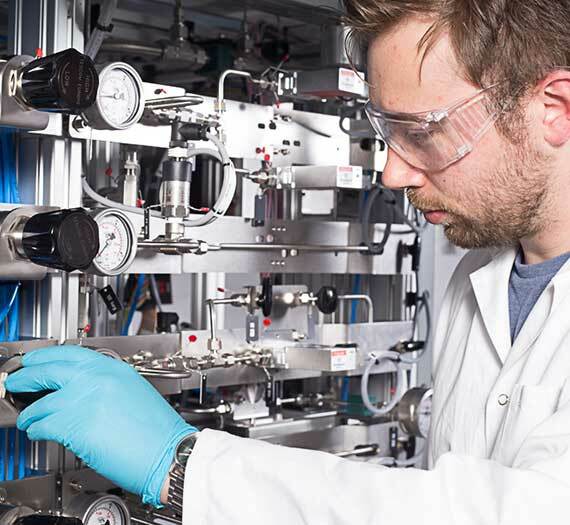 Front-end selective hydrogenation is significantly more challenging as front-end catalysts are implemented upstream of the cold-box in the plant prior to the separation of hydrogen from olefins. The high hydrogen partial pressures result in significantly higher reaction rates and heat of reaction. The results of this study clearly showed that the unit that worked well for tail-end selective hydrogenations was well suited for C2-front-end testing but not for C3 or above as reaction runaways in the upper portion of the catalyst bed could clearly be observed. This is an excellent example of “failing fast” and helped our client make an investment in a unit, which ultimately was not up to the task. It is worth mentioning that the clients own in-house testing units suffer from the same problem. ILS is currently working on an improved design to test this. The overall time for construction of the feasibility unit till delivery of data was 4 months. SAPO-24 zeolite membranes provide a powerful way to separate CO2 from natural gas mixtures in an energy-efficient manner. ILS was approached by a client interested in exploring the possibility to produce such zeolite membranes on support materials using a flow-approach. Normally membranes are made in a static environment using a seeded support in a simple autoclave. The disadvantage of this approach is that gravity dictates that the membrane is thicker on the bottom than the top (membrane support is vertical) resulting in axial inhomogeneities in the gas flux through the membrane. 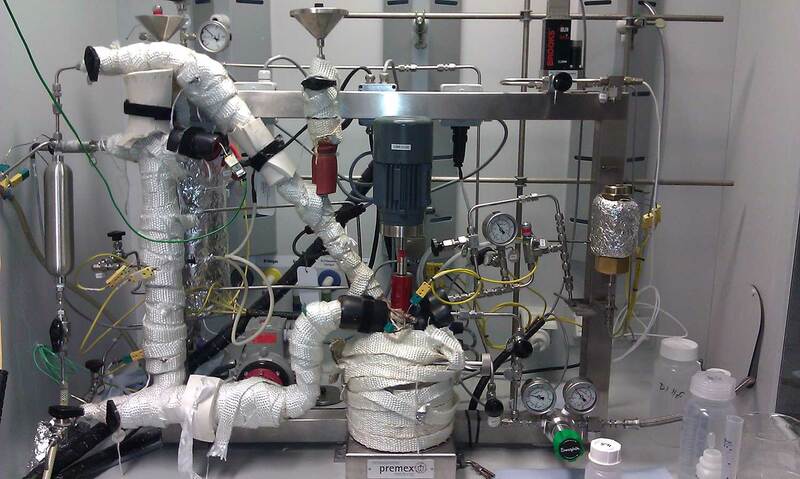 ILS performed a feasibility test on an initial recycle concept to determine the best way to quantitatively recycle very hot mixutures of amine-containing abrasive zeolite slurries. Multiple synthesis were performed and many iterations and improvements to the design were made. 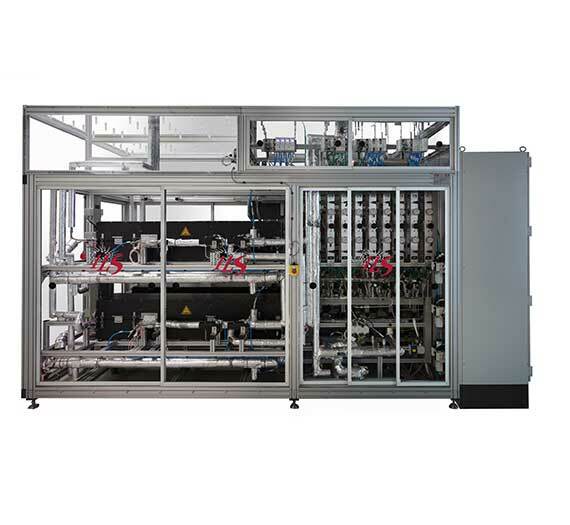 Successful completion of the feasibility meant that a full-scale high-throughput unit could be built. Additionally, the client chose to prolong the ILS testing campaign in order to continue to generate data before the larger, high-throughput unit was done. Emmissions catalysts are an integral part of automotive and truck motors. In particular for diesel motors, the development of effective NOx catalyts is critical. Increasingly-stringent norms are pressuring both automotive catalyst makers and car/truck-motor suppliers to come up with new solutions to effectively address this. ILS was approached by a client requiring exceptionally high heating and cooling rates required to simulate the latest automotive catalyst driving cycles. Heating and cooling rates on the order of 50°C/s were required! ILS designed, constructed and operated an in-house developed test-stand to demonstrate the ability to meet these challenging new criteria. The ILS automotive catalyst testing unit is unique in its ability to heat and cool with the above mentioned ramping rates. The successful ability to meet these criteria resulted in ILS being chosen as the preferred supplier for supplying an entire test facility to a major automotive manufacturer. The overall time from start-to-finish of this project was 5 months.